I’ve read it over and over, heard it in workshops and plenary sessions. A good story isn’t about any one character or group of characters. Instead, it’s about those characters doing things. Striving, reaching, hurting or being hurt, trying and failing and trying again, coming, going, living, learning. It’s about the events that happen to the characters—the foundation, the buildup, the action, and the consequences—followed by the next event and so on. These threads weave together to create tension in the book which keeps the reader on the edge of her seat (hopefully) all the way to the dénouement. The trick, as I understand it, is to write every scene in such a way that it furthers or at least maintains this tension. The challenge, for me anyway, is learning to write structural scenes—ones that don’t have high-energy but are necessary to set up later action scenes—in such a way that they too convey some element of dramatic tension. The Kill Zone, Terrible Minds, and other blogs talk about the necessity for this, while recognizing that the reader also needs periodic breaks to catch her breath. Right now, I’m a little more than halfway through the first draft of my novel’s sequel, and struggling with a few structural scenes that set up the last quarter of this book and the entire premise of the third book in the trilogy. It’s crucial that they deliver the necessary information; telling/showing it in such a way as to make the reader care is what takes so much time. These scenes are always (for me) harder to write than the more action-packed ones, but some days the words just WILL NOT come. I write, erase, write, erase, and write until my wrists ache, then I put on my braces and write some more. Usually I’m shooting for a target word count but even if I make that number for the day, it won’t matter unless the words count. If I have to erase them the next day and start over, what have I gained? This is the best thing I’ve ever written. This has a few problems. This is the worst thing I’ve ever written. For a hilarious visual concept, see the interpretation by Captain Jack Sparrow. At any rate, today was a Level 3 day. 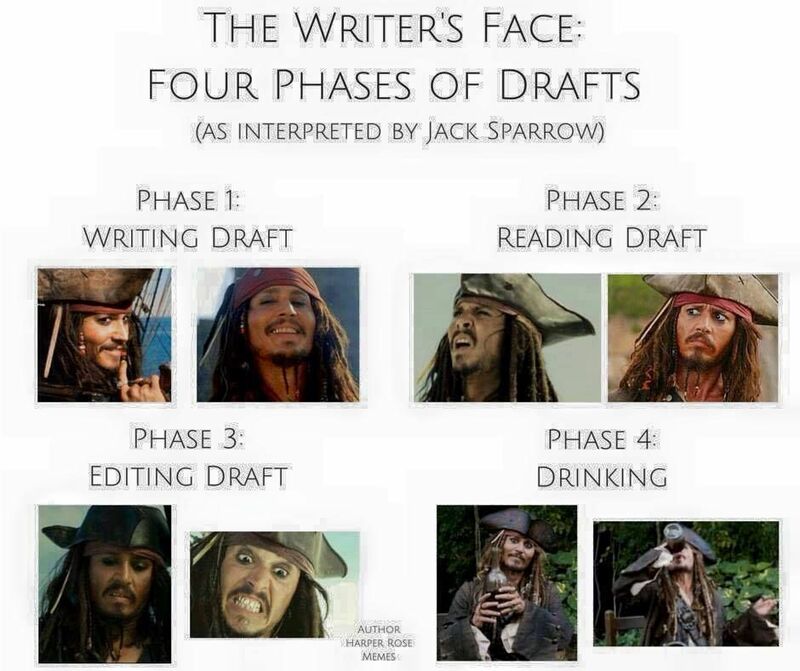 I’m sure tomorrow (or the day after) will spring back to Level 1 or forward to Level 6 but for a first draft, I suppose I’m right (write) on target.